Lessons at my studio: Take lessons at my Home Studio on a 6'4 Grand Piano. 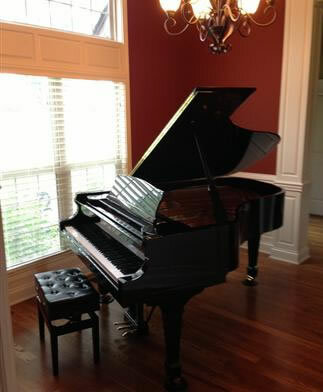 In Home Piano Lessons: Need to save some time, talk to me about the possibility for In -Home Music Lessons. Teaching Teens can be very rewarding but often difficult to produce lasting results. The huge demands on a teens time make it difficult for most teachers to have a successful approach with this age range. Through the years I have specialized in teaching teens. With an "out of the box" approach to teen lessons I have found that most teens can learn what they want and progress to a point where they have a life long love of playing the piano. Whether it is their first time taking or a 25 year break in between lessons many adults have decided that they want to learn the piano. Typically, their main goal is to get to the point where they can successfully play sheet music for the songs they enjoy. I have a method that I use almost exclusively with adults that is designed to bring them to this level of playing. As always, I approach each student as an individual and will teach to their specific goals. Online Lessons are available through Skype, FaceTime and Google Hangouts. Please contact for more information.